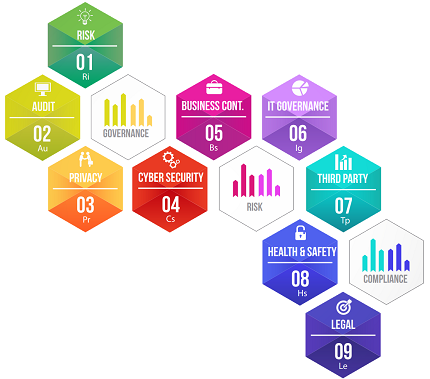 Many organizations leverage readiness and maturity assessments as a starting point to their GRC Journey to analyze and understand the current state and future state of their status as an input to their business case and overall strategy plan. Defining short and long term GRC vision, building guiding principles and getting executive management support happens all in this stage. We provide below services in this main category to kick-start your GRC journey and future GRC plans together. Synergistically evolve into integrated approaches rather than siloed spreadsheets and multiple applications with our GRC Strategy services. Quickly build understanding, vision, and deploy a strategic roadmap with promised benefits of having a GRC capability. GRC enables highly efficient processes and enabled data driven decision making. Exploit the diverse outcomes of this worthy change and well identified and managed GRC capability with us.